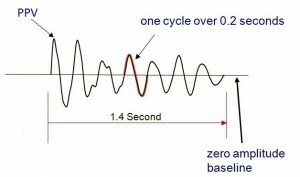 The waves are described in terms of amplitude and frequency. Amplitude is a description of the amount of movement a particle experiences as the energy passes. It is common practice to measure blast vibration amplitude as particle velocity or the speed at which a particle vibrates. The units of particle velocity are generally given as mm/sec (millimeters per second) or in/sec (inches per second). Radial or longitudinal: front to back. The instrumentation used to make such measurements employs sensors that output this type of information. For example in the figure below, the horizontal axis represents time (seconds) and the vertical axis represents particle velocity. In this case the ground vibration event lasts for 1.4 seconds. Each component will exhibit a peak particle velocity (PPV) during a vibration event. The highest value of these three components is the maximum peak particle velocity, which will primarily be controlled by the amount of energy released and the distance from the blast.